BEARING CHARACTERISTICS Characteristics of bearing types and application Deep Groove Ball Bearings Deep groove ball bearings are non-separable, comparatively rigid radial bearings, their balls are guided in deep radial running grooves. They are characterized by a high radial and axial load carrying capacity and can operate at very high speed. Combined loads are accommodated to an optimum degree - in fact, at higher speeds they are often better suited to transmit thrust loads than the ball thrust bearing. For these reasons and their economical price, it is the most widely used bearing. Deep groove ball bearings are also available with one or two non-rubbing metal shields (Z, ZZ) or rubbing seals (RS, 2RS) made from synthetic rubber. Bearings with two shields or two seals are pre-lubricated with the correct quantity of grease of a lithium base which permits operating temperatures of – 30°C + 120°C (-22°F + 248°F). Deep groove ball bearings with snap ring groove (N) and snap ring (R) in the outer ring enables a simple and space-saving axial location in the housing. A greater degree of misalignment can sometimes be accommodated if pure radial load is applied, particularly if the misalignment results from occasional peak load, and if the bearing had sufficient radial internal clearance after mounting to avoid excessive stresses. Angular Contact Ball Bearing There are single-row and double-row angular contact bearings and also duplex ( four point contact bearing). Single-row angular contact ball bearings are nonseparable and the standard types feature a contact angle of 40°. They are suitable for the accommodation of combined (radial and axial) loads. Axial loads may be transmitted in the direction of the closed faced or high shoulder only. Optimum load transmission starts with Fa ≥ Fr. Radial forces induce internal axial forces which are absorbed by the opposed bearing. Such bearings should therefore be mounted in pairs, and should be adjusted against another bearing. In the case of length variations of the shaft caused by changes in temperature, which also affects the internal clearance, the distance between the bearings should be kept small. The maximum permissible speed is somewhat lower than that of deep groove ball bearings. A slight angular deflection is still possible with the single bearing; if bearings are mounted in pairs, however, rigidity greatly increases together with the ability to prevent misalignment. Single-row angular contact bearings can also be supplied with side faces ground for mounting side-by-side, Suffixes Df, DB, and DT are being used in the bearing designation, ie 7250 BG. They can be mounted in any of three combinations depending on the loading characteristics: -- A back-to-back arrangement (closed face together, load line of the bearings diverging towards the shaft axis) is used where rigidity and an ability to absorb fitting moment is required. -- A tandem arrangement (open face-to-closed-face load lines being parallel to each other) is used for thrust loads equally distributed over all bearings, absorbed in one direction only. Adjustment against another bearing which accommodates the opposed thrust load is necessary. Double Row Angular Contact Bearings The inner and outer ring of these bearings each have a double raceway, and the two rows of balls have contact angles that are similar to a back-to-back arrangement. Thrust loads can be accommodated in either directions as well as fitting moments. Greater misalignment, particularly under pure axial load, can become critical. Double Row Self-Aligning Ball Bearings This design of bearing utilizes two rows of balls, with the inner ring having two deep groove raceways and the outer ring a single continuous spherical raceway. This permits the inner and outer ring to be misaligned relative to each other through a comparatively large angle without imposing moment loads upon the balls. This bearing is frequently used when the inner ring is to be mounted upon an adapter sleeve or when conditions in the machine make it difficult to assure accurate alignment of the inner and outer rings. Due to the small contact angle, the thrust capacity of these bearings is limited. Angular Misalignment The following is an approximate guide to the misalignment that can be accommodated in a double row self-aligning ball bearing: 0.04 radians between 2.5 and 3 degrees depending on which series is used. Cylindrical Roller Bearings The rollers of these bearings are essentially cylindrical in shape, providing modified line contact with the cylindrical inner and outer ring raceways. The rollers are accurately guided by ground ribs on either the inner ring or the outer ring, thus making these bearings suitable for heavy radial loads and high speed operation. For best results, these bearings should be accurately aligned. The cylindrical shape of the rollers allows the inner ring to have considerable axial movement relative to the outer ring. This feature is valuable in accommodating thermal expansion in applications where both the inner ring and outer ring must be press-fitted. Also, since the inner and outer rings are separable from each other, the assembly of equipment is frequently facilitated. Greater misalignment under heavy radial load can be critical. Tapered Roller Bearings This design utilizes conical rollers and raceways arranged so that all elements of the roller and raceway cones meet at a common apex on the axis of rotation. The rollers are guided by contact between the large end of the roller and a rib on the high capacity for radial loads and single direction thrust loads. The bearings are usually mounted in pairs with axial adjustment to provide proper running clearance within the bearings. Being separable, inner and outer rings may be mounted individually. For heavy thrust loads, the type 30300 with large contact angle is desirable. Tapered roller bearings with two and four rows of rollers are used for special applications. This is under normal loading conditions. Spherical Roller Bearings In this design, two rows of rollers operate in separate raceways ground into the inner ring with guide rib to guide the rollers. The outer ring has a single spherical raceway, thus allowing the inner ring and rollers to freely compensate for angular errors due to inaccurate machine components or due to elastic deflection of the shaft or housing under load. As a result of the line contact, a large number of rollers, and the substantial contact angle, these bearings have large radial and thrust load capacity. They are suitable for heavy shock and impact loads and thus are extensively used in steel mills, rock crushers, and heavy industrial equipment. 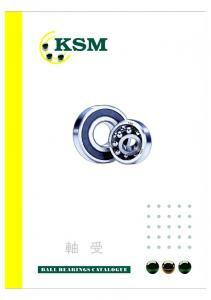 Thrust Ball Bearings Thrust ball bearings are separable bearings. The single-acting thrust ball bearing consists of shaft washer, housing washer and ball set with cage, the double-acting type of a shaft washer ( centre washer), two housing washer and two ball sets with cages. Thrust ball bearings can be applied for high axial loads and low to medium speeds, they cannot, however, take radial loads. They are sensitive to angular deflection and characterized by extremely rigid guidance in axial direction. Depending on speed a minimum load is necessary to avoid sliding movements of the ball set, which are caused by centrifugal forces. To compensate for misalignments of the shaft, bearings with spherical housing washers and support washers should be used. BEARING SELECTION The following procedure gives the steps to be followed when bearings are selected from the information contained in this catalog. It will be found satisfactory for most applications. 1. Determine the speed of the bearing. Calculate the loads on the bearings. 2. Establish if accurate alignment can be obtained between the bearing seatings. If it cannot, then bearings that accommodate misalignment should be selected. 3. If the bearings rotate under loud decide the life required, calculate the required dynamic load rating ‘C’ values, and then select suitable bearings that have comparable ‘C’ values. If the bearings do not rotate under load selected them by using the static load rating ‘C0’. 4. Check if the bearings are suitable for the speed and decide of grease or oil is to be the lubricant. 5. Select a suitable bearing arrangement of this is not already known; make sure that the seating fits required can be used with this arrangement. 6. Decide if bearings to ‘Standard’ or ‘Extra Precision’ limits of accuracy are required. Select the most suitable range of radial clearance. Choose the abutment diameters. Choose suitable closures. 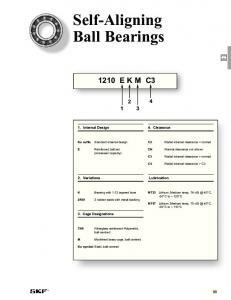 Issue mounting and handling instructions for the bearings if necessary. Selecting Of Bearing Type Each type of bearing has different properties, making it suitable for certain applications. The factors to be considered when choosing a bearing are numerous, so guidance is given to the main points when selecting a bearing. It must also be remembered that special consideration must be given to aspects relating to the running and operating, and to aspects relating to cases where at least one of the principal dimensions of the bearing has been determined by the machine design or shaft size. Load And Direction Of Load The magnitude and direction of the external loads, along with built in factors of safety, are two of the main points which determine the bearing size - and in some instances - the bearing type to be used. The important factors are the speed of rotation, temperature, the amount of precision required, mounting conditions, and running noise. The following illustrations indicate the magnitude and direction of the external loads which the bearings will provide for. Radial Loads For light and medium radial loads, ball bearings are generally used; whereas for heavy loads and large shaft diameters, roller bearings are often the only choice. Cylindrical roller bearings are available in several types. Types NU (with outer ring ribs), and N (with inner ring ribs) are only suitable for radial loads, whereas the NUP, NJ, and NJ with angle ring HJ can be used to a certain extent to take combined loads. Thrust Loads Thrust ball bearings are only suitable for light or medium purely axial loads. Double-acting thrust ball bearings can carry thrust loads in either direction. Spherical roller thrust bearings are used where heavy thrust loads are to be absorbed, and in addition can carry a certain amount of radial load acting simultaneously. Limiting Speed The speeds at which bearings can rotate are limited by the bearing type, the operating load and the permissible operating temperature of the lubricant. Bearings with low frictional resistance, and correspondingly low internal heat generation, are most suitable for high speeds with proper attention being given to the correct bearing clearance after mounting. For radial loads the bearings most suitable are deep groove ball bearings or cylindrical roller bearings. For combined loads angular contact bearings should be selected. Misalignment Self aligning ball bearings, spherical roller bearings and spherical roller thrust bearings allow, at assembly, for the correction of misalignment where the shaft can be misaligned relative to the housing. Values for permissible angular misalignment are listed in the tables which precede the bearing sizes of those particular types. Low Noise Level Even though the running noise of rolling bearings is so low that it is lost in the background noise of other moving parts. It is sometimes of prime importance to reduce this to a minimum level for electric motors used, for example, in lifts for hospitals and hotels, and other domestic appliances. Such applications usually demand the fitting of a deep-groove ball bearing selected for low noise level. Rigidity This is sometimes a very important requirement, especially on machine tool spindles, where rigidity controls the bearing selection. In applications of this nature, single or double row cylindrical roller bearings or taper roller bearings are best suited, compared with the point contact of ball bearings. The stiffness can be further enhanced by pre-loading. Axial Movement In a normal bearing arrangement supporting a shaft, it is usual to locate one bearing (fixed) and allow the non locating bearing (free) to float in the housing, thus preventing axial pre-load as a result of thermal expansion of the shaft. Axial movement produced by thermal expansion can be accommodated by the use of a cylindrical roller bearing of the N or NU pattern. This allows axial movement to occur by displacement of the rollers over the track. Tapered Bore And Sleeve Mounting Tapered bore bearings are used for easier mounting and adjustments of the radial clearance. It is usual to fit sleeve bearings on a bright drawn steel bar, thus cutting machining costs and simplifying assembly. Withdrawal sleeves are used to ease the removal of the bearing. The residual clearance should be checked with the tables relating to the axial drive-up for spherical roller bearings and the bearing size. Precision Rolling bearings with a higher degree of precision than normal are required for shafts where running accuracy is of prime importance - for example, machine tools spindles and shafts rotating at very high speeds (see section relating to bearing tolerances). BEARING LIFE AND LOAD RATINGS Determination Of Rolling Bearing Size To determine the size of the bearing, static and dynamic load conditions and design life requirements must be considered. The load ratings for the size and type are given in the bearing tables on the appropriate pages. Dynamic Loading When a batch of apparently identical bearings is tested under identical load, speed, and operating conditions, a wide difference is obtained in the lives of the bearings. Typical results are plotted below - this graph shows the 'rating life' (sometimes called the '90 per cent survival life'). This is the calculated life obtained by following the procedure set out in this catalogue. Also shown is the average life, which is appreciably greater than the ‘rating life’. Basic Dynamic Load Rating Cr Basic dynamic load rating (Cr) is defined as that constant radial load which a group of apparently identical radial ball bearings, angular contact ball bearings, and radial roller bearings can endure for a rating life of one million revolutions. For thrust ball bearings the basic dynamic load rating is that constant, central, axial load which a group of apparently identical thrust bearings can endure for a rating life of one million revolutions. Static Load Rating Co The static load Co is defined as a load acting on a non-rotating bearing. Permanent deformations appear in rolling elements and raceways under static load of moderate magnitude and increase gradually with increasing load. The permissible static load is, therefore, dependent upon the permissible magnitude of permanent deformation. Experience shows that a total permanent deformation of 0.0001 of the rolling element diameter, occurring at the most heavily loaded rolling element and raceway contact, can be tolerated in most bearing applications without impairment of bearing operation. Rating Life Rating life (L) is defined as the number of revolutions (or hours at some constant speed) that 90% of a group of apparently identical bearings will exceed before the first evidence of fatigue develops. This may be referred to as B10 life. To determine the size of a rolling bearing for a particular field of operation, it is necessary to establish the nominal life corresponding to the field of application. = nominal life in 106 RPM = life in 106 kilometers traveled = diameter of wheel in meters. Values for selecting service life in kilometers covered are in table below. The wear life diagram indicates the operating conditions, with the least wear factor at curve A and the heaviest wear occurring at curve B. The area between A and B is subdivided into individual fields from a to k. It can be seen that the operating conditions deteriorate progressively. Lna = a1.a2.a3. Lna = a1.a2.a3. Lna = a1.a2.a3. Calculations for the adjusted rating life are based on the pre-conditions mentioned in the above formulae; for example, that bearing loads can be calculated with accuracy considering all aspects of the loads involved along with shaft deflection etc. Also, that reliability of the bearing materials are in accordance with the corresponding C values and that normal operating conditions a1=a2=a3=1 and that two life equations become identical. Life Adjustment Factor A2 For Material The factor a2 accounts for the properties of the material and its heat treatment. a2=1 is applicable to the high quality steels used in the production of normal bearing series. Lubrication conditions are constant throughout. Operating viscosity is based on actual operating temperature. Lubricant contamination is limited during the whole running time. (e) The service life limited by wear and break down of lubrication is not shorter than the fatigue life. Wear of the acting surfaces is primarily caused by contamination which, over a period of time, may penetrate the bearing. The situation is made worse by inadequate lubrication and corrosion due to condensation. The amount of wear experienced in a bearing is dependant on the operating conditions, lubrication, and effective sealing arrangement. Wear Factor The permissible amount of wear is expressed by the wear factor fv. = XFr XFr + + YF YF aa [Kn] [Kn] PP = The factors X and Y depend upon the ratio Fa/Co. (The relationship of the axial load to the basic static load) the values shown in the table are applicable to bearings mounted with normal fits – shafts machined to j5 or k5 and housings to J6. Axial Loading Capacity If deep groove ball bearings are axially loaded this should generally not exceed 0.5 Co. For small bearings and light series the axial load should not exceed 0.25 Co. The values for Y1 Y2 and e are given in the bearing tables. Equivalent Static Load Po = Fr + Y0 Fa The Y0 values are given in the bearing tables. For paired bearings, Fr and Fa are the loads acting on the pair. Since the loads are transmitted from one raceway to the other in an inclined position, radial loads induce axial reaction forces which must be considered when calculating the equivalent dynamic load. For calculation purposes, the equations show where bearing A and bearing B are subjected to a radial load Fr A and Fr B, respectively, and are always considered positive even when they act in the opposite direction to that shown in the figures. The radial loads act at what is termed the "pressure center" of the bearings, which is given in the bearing tables as dimension “a”. There is an external force Ka = 0; the equations are valid only if the bearings have been adjusted against each other to practically zero clearance and no preload. The permissible axial load depends on the ability of the roller ends to slide on the surface of the ribs (not fatigue values). It is therefore very important that adequate lubrication is present to assist this and dissipate heat generated by this action. The formula mentioned above is used as a guidance to calculate a suitable axial load along with the “k” factor mentioned in table 2. The formula is based on ideal conditions with (a) maximum temperature differential of up to 60°C (140°F) between ambient and bearing temperature (b) a specific heat elimination of 0.5 mW/mm² C (c) viscosity ratio k 1.5. “k” indicates an effective viscosity ratio v at working temperatures, against v1 viscosity required for a satisfactory lubrication of the bearing. In case of grease lubrication for v ratio, the basic oil viscosity will be used. If viscosity ratio “K” is smaller than 1.5, friction and wear is generated. These can be reduced at lower speeds by use of oils with EP additives. The thrust loads Faz obtained by the formulae are valid for constant axial loadings. For short duration the values can be doubled and may be trebled for shock loads. For cylindrical roller bearings to function satisfactorily under thrust loads, there must also be radial loads present. The ratio of Fa/Fr should not exceed 0.4. The axial loading of bearings has, of course, a certain influence upon their service life. This influence can be practically ignored if the Fa/Fr ratio is ≤ 0.2 in case of bearings in series 10, 2, 3, and 4, and Fa/Fr ≤ 0.4 for bearings in series 22 and 23. In any case of thrust loads which act upon bearings, factor Fa (N) should not exceed the numerical value of 1.5 D² (D = outer diameter of the bearing in mm). In case of certain high thrust loads (Fa ≥ D²), it is recommended to have the ribs of inner and outer rings completely supported by the integral parts of the shaft & housing. NUP, NJ and HJ type bearings, which take thrust loads from both directions, should always be so arranged that – if the construction of the bearing permits it – main thrust loads are taken by the ribs. Values for Y1 , Y2 and e are given in the bearing tables. Equivalent Static Load Po = Fr + Yo Fa Values for Yo are given in the bearing tables. For paired bearings Fr and Fa are the loads acting on the pair. Since the loads are transmitted from one raceway to the other in an inclined position, radial loads induce axial reaction forces which must be considered when calculating the equivalent dynamic load. For calculation purposes, the equations show where bearing A and bearing B are subjected to a radial load Fr A and Fr B, respectively, and are always considered positive even when they act in the opposite direction to that shown in the figures. The radial loads act at what is termed the "pressure center" of the bearings, which is given in the bearing tables as dimension “a”. There is an external force Ka = 0; the equations are valid only if the bearings have been adjusted against each other to practically zero clearance and no preload. THRUST BALL BEARINGS Equivalent Dynamic Load P = Fa Where Fa is the axial load (ball thrust bearings can accommodate thrust loads only). Equivalent Static Po = Fa Ball thrust bearings must have a minimum thrust load to function correctly. This ensures that sliding does not occur due to centrifugal forces acting on the ball and cage assembly. In many cases, the axial load acting on the bearing produced by the weight of the supporting component parts and external forces is greater than the required minimum load. If this is not the case, then bearings must be preloaded (for example, using springs). LIMITING SPEED The maximum rotational speed of ball and roller bearings depends upon various factors: the size and design of the bearing, type of lubrication (whether grease or oil), and type of cage fitted, along with the internal clearance of the bearing when mounted. If the radial run-out (which produces out of balance forces) is reduced, then higher speeds can be obtained. Reduction of cage weight will also reduce out of balance forces, such as when made from light alloy or plastic. Cages that are centered on the inner or outer races rather than the rolling elements are used for high speed applications. With the surface of the riding lips having been specially ground, lubrication between the sliding surfaces must be maintained. Heavier loads influence the speed and also affect the basic rating life of L10h ≤ 75000 hours. In such cases, the speeds listed in the tables should be multiplied by a factor f which you can obtain from the fig. 1 below. For ball thrust bearings, there must be a minimum load applied to counteract the centrifugal forces of the balls on rotation. Factor M is indicated in the bearing tables against the appropriate bearing size. BEARING MATERIALS MATERIALS USED IN THE MANUFACTURING OF ROLLER BEARINGS Bearing rings and rolling elements are subjected to high stresses on a very small contact area, and must have a high resistance to wear as well as high elastic and fatigue limits. Primarily these are manufactured from high-carbon chromium bearing steel with a chemical composition as indicated in table below, and are in accordance with SAE 52100 - 100Cr6. Report "BEARING TYPES. 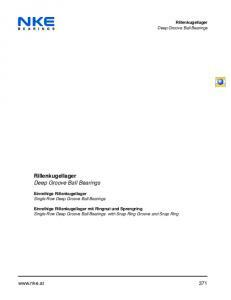 Deep Groove Ball Bearings. Self-Aligning Ball Bearings. Angular Contact Ball Bearings. Cylindrical Roller Bearings"